Four Season Vacation Rental. Located right on the Michigamme River, this riverside retreat provides you and your family and opportunity to get away from it all and back to nature. One block from Iron Ore Heritage Trail, offering snowmobiling, snowshoeing and cross country skiing. Ice fishing right in front of the cabin. Outdoor grill and fire pit available. Summer rental: Iron Ore Heritage Trail is suitable for Bike, Inline Skating, Fishing, Mountain Biking, Walking, four wheeling. Close to restaurant, bar, church, and small store. 4 Kayaks available for use, gas grill and fire pit. Deck overlooking the river, dock, electric stove, refrigerator, microwave, washer, dryer, DVD player. Relax and get away from it all! One queen bed, one bunk with double on bottom and twin on top. Charlie and Shelly live in Minnesota, but have always enjoyed their vacations to the UP and Charlie's home town of Republic, Michigan. They will be enjoying the property most of the summer, however, the property is available all winter long for winter sports and vacations in addition to limited availability during the summer months. In two more years we will be able to enjoy the peace and quiet of small town living on a river. We were looking for a smaller house, mostly one level with a great sunset view. We never imagined we would find a place as perfect as our Four Season Rental. We are looking forward to long kayak rides, campfire, relaxing and reading on a deck. In the fall we are planning hikes with full color along the Heritage Trail. Winter? Ha! We will be in Arizona! But there's lots to do (cross country skiing, snowmobiling, etc) for those of you who enjoy the cold fresh air with lots of snow. Whether you are looking to relax or enjoy hiking, fishing, kayaking, cross country skiing or snowmobile - so many opportunities along the Heritage Trail. Trail entrance is a walkable distance from our home. Bathroom has shower, sink and toilet. No bathtub. 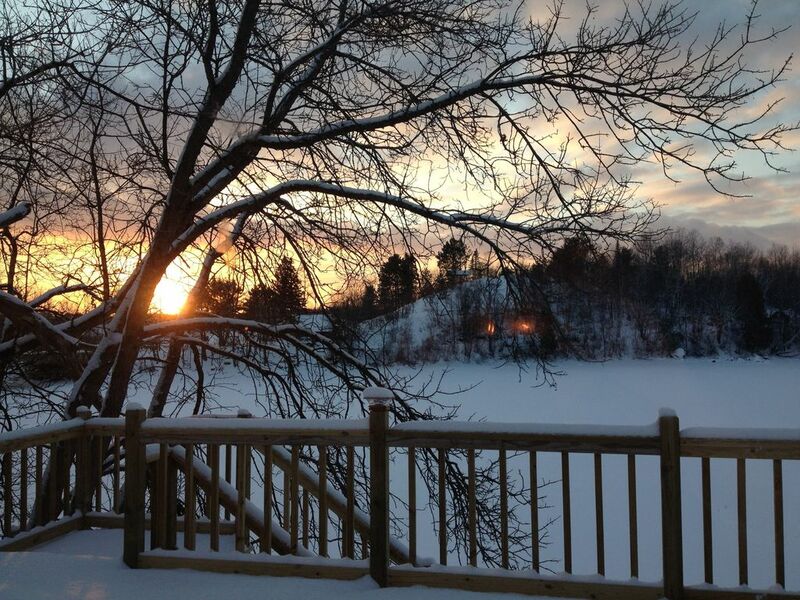 Our property is right on Lake Michigamme in the small town of Republic, Michigan. If you want to experience small town living, this is the place. Wifi available, however, not guaranteed. Just recently installed and uncertain how coverage will be. Not guaranteed, but available most of the time. Small and limited coffee provided. New pots and pans, baking utensils, glasses, cups, silverware, crock pot. The view is spectacular, the property was as advertised, only caught one fish. The fall colors were just starting when we arrived, but were spectacular before we left. The Friday night fish fry at the local restaurant was excellent. We would not hesitate to stay at this property again. This cottage was the perfect getaway for my family for a long weekend. Everything we needed was already at the house and easy to find. We were lucky enough to have amazing late summer weather on the river, but I wouldn't mind watching some rain come in from the comfort of indoors either. Thanks again for letting us stay in your lovely home away from home! Great cabin for our long weekend in early September. The river view was just like the picture. We enjoyed many hours on the deck overlooking the river and had a great time kayaking and fishing too. The cabin is small, but it worked fine for the four of us. The kitchen has everything you would need. As an added bonus, the colorful bathroom towels smelled fresh and clean. We enjoyed the short walk to a nice little diner in town with good pizza and broasted chicken and a great country breakfast. The owners were so great to work with and helpful. What a nice little river cabin in a small town! Centrally located to explore the U.P.